Our team at Rodriguez & Associates is passionate about our community, inspiring the greater Bakersfield and Kern County area! Our team couldn’t be bigger education advocates. 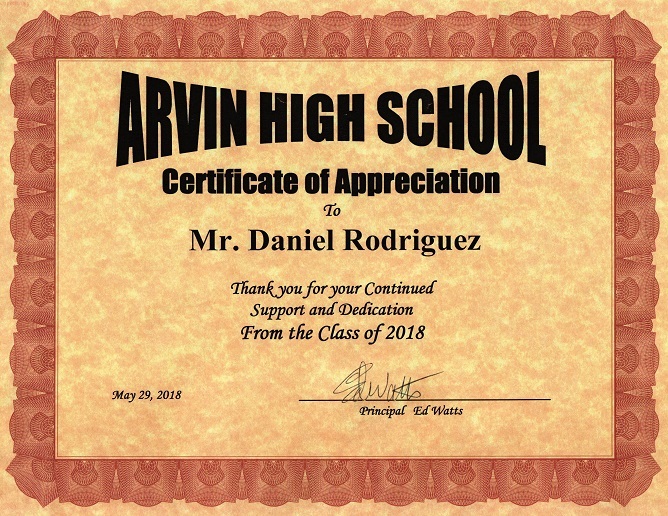 We support Kern County students in a number of ways – attending career fairs, speaking at schools and funding scholarships, to name a few. 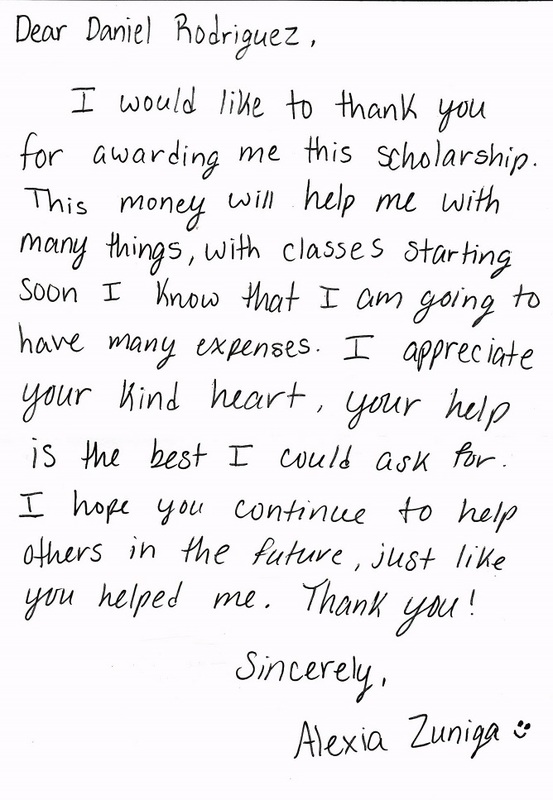 These thank you letters from some of the Arvin High students who benefitted from our scholarships mean so much to us. Knowledge is power. 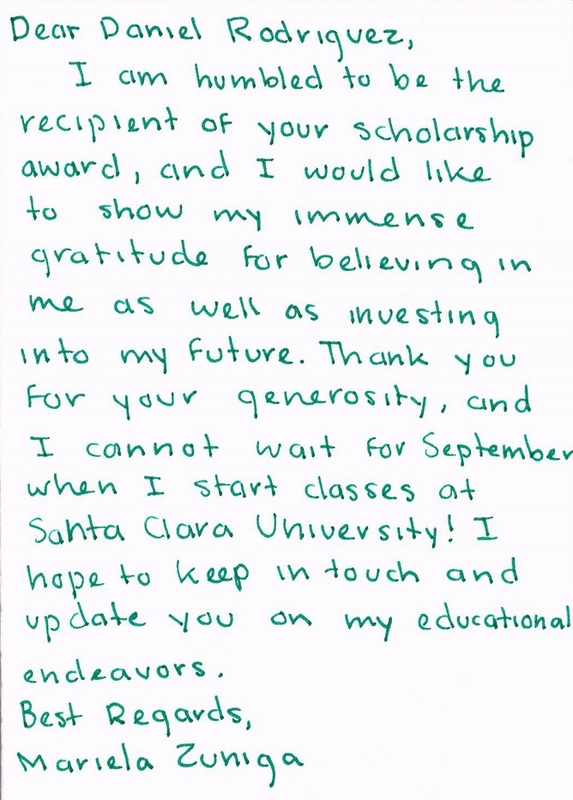 Our Bakersfield personal injury law firm is so proud to be able to give back and support young people – they are our future. 1. It’s okay to be yourself. Law schools indoctrinate students with legal theory and case law. There is some discussion about alternatives, but in most cases, applying the law to the facts is clear cut, on one side of the line or the other. There is little room for human experience or feelings. Real life, however, is not so black and white, and more often than not, real cases often come in shades of grey. Just as in life, so too, does the human factor play into so many cases. Impressions matter. Cooperation matters. Character matters. 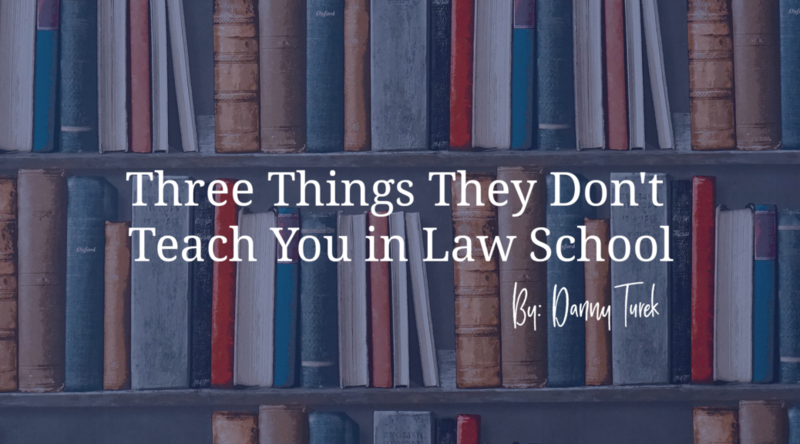 Law school doesn’t teach you about the advantages in law practice of embracing who you are, where you came from, and what you are passionate about. In nearly every interaction as a trial lawyer, rapport plays a significant role. When talking to a new client about a case, for example, sharing something about yourself early on lowers the resistance most clients have in sharing their story and asking for help. When going over a witness’ background in deposition, asking them about their passions, and when was the first time they knew they wanted to be in the position they are now, likewise lowers resistance and makes information gathering that much easier. Curating that connection between you and their passions or ambitions creates a rapport that may leave the defending lawyer muttering to themselves, “This lawyer knows my witness better than me.” Either way, you are far more likely to get the information you need if you embrace this dynamic early on in a deposition. When meeting and conferring with opposing counsel, finding something meaningful in common diffuses tension and promotes cooperation. I recently asked an older opposing counsel for advice on something unrelated to our case as we were waiting for a deponent to show up to a deposition. In response to my question, this lawyer turned in his chair, sat up, and was glad to share his experiences with me. (Turns out he used to be a plaintiff’s attorney!) Just that simple exchange has made conflict resolution that much easier over the remainder of the case. In front of a judge, too, credibility is of utmost importance. One easy way to establish credibility is to simply channel what you know to be true about yourself. This authenticity about yourself translates to an impression that you are being authentic about your case, your client, or whatever issue is before the bench on a given day. When you know your opponent has made a good point, say it! Then counter with your own reasoning. Don’t be afraid to be yourself, you might be surprised by the results. 2. Some lawyers don’t follow the rules. As law students, we are taught that rules matter. The Code of Civil Procedure, the jury instructions, the Evidence Code—all of it adds up to rules that are sacred to every lawyer, or so I thought. When I got out into practice, however, I was astonished to find so many lawyers bending or breaking the rules. 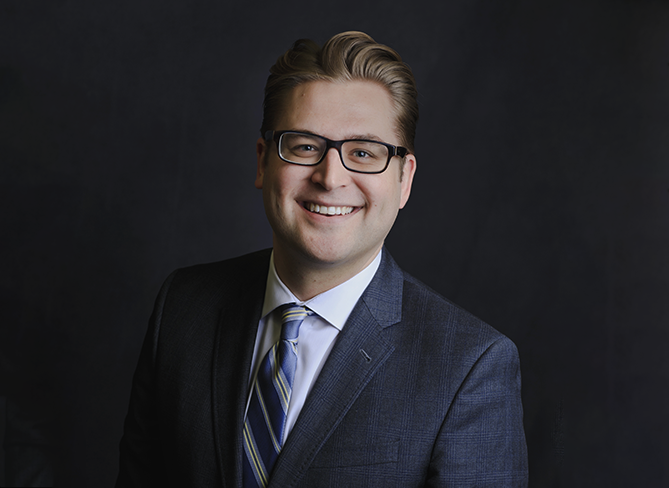 It is true that such lawyers might be the exception that proves the rule, but I’ve seen it so often in my first year of practice that I’ve already had to adapt my approach. For example, large corporations defend themselves by limiting access to information through delay, deflecting responsibility, blaming others, and, occasionally, outright obstruction. The Code of Civil Procedure exists for a reason (among others): to hold lawyers accountable for obstructionist lawyering! In basic discovery alone, the excuses are endless: “this will take a lot of time;” “we have no clue where the car is;” “I’ll have to go to my boss with this and who knows how long he’ll take;” “this is not remotely relevant;” etcetera, etcetera. Even casual “in the spirit of cooperation” emails with “responding” documents fly in the face of the Code and add more to the procedural plate of the plaintiff’s lawyer. Holding a lawyer to his word shouldn’t be as difficult as it is and lip service alone is all too common. Meet and confer letters often don’t bear fruit. It takes the judge reminding the lawyer of his professional duties (by means of granting motions to compel, for example) to move the needle. Seeing this in action, I’ve adapted my practice to be more proactive about heading these kinds of defense tactics off from the start. I’ve also accepted that patience, above all else, might just be the plaintiff lawyer’s greatest virtue. 3. Leverage what you don’t know. There’s an old proverb that goes something like this: “A wise man never knows all; only a fool knows everything.” In law school, your success is measured based on what you know. How much law can you cram into your head before an exam only to word-vomit back on the page and move on? This is often the exercise in law school. In law practice, by contrast, I’ve learned how important it is to be honest with yourself about what you don’t know. These gaps in the story are often the most crucial in terms of discovery. In order to uncover them, however, it is important to be brutally honest with yourself about what it is you do and do not know. Early on in a case, lawyers must wear the hat of detective. This is the essence of good discovery. And I have to remind myself of something that I learned from Sherlock Holmes, the greatest detective of all time: Often the loudest dog is the one that’s not barking. Where are the holes in my case? Which parts of the story need developing? What is odd or missing? These are the questions that matter. Sure, good lawyers know a lot about the law. But great lawyers, I’ve found, are keen on gaps in their cases. Being a lawyer is a lifelong journey. We’re always honing our craft. Graduating from law school, while a necessary hurtle, is only the beginning. Last summer, our Founder and Managing Partner, Daniel Rodriguez had a life changing experience in the African Savanna. Daniel has always been a fighter and a fierce competitor, both in the courtroom and in life; he has always been an excellent athlete, as well. After being diagnosed with arthritis in his big toe, Daniel was faced with the loss of his life-long passion for running. However, in his typical style, he looked at the odds and decided to fight back. 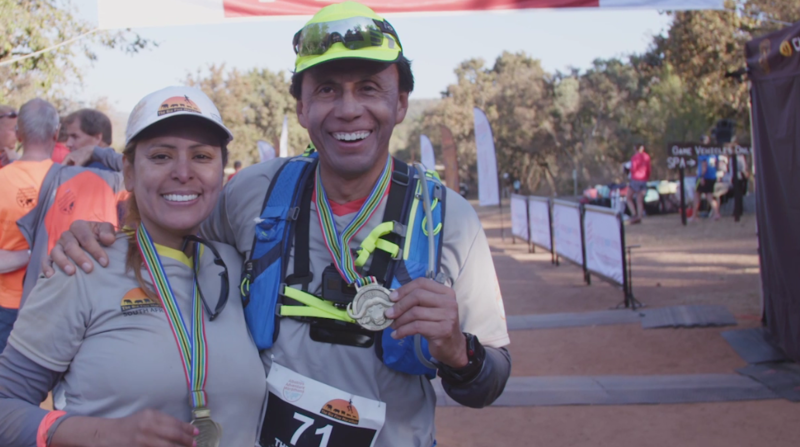 Instead of choosing to slow down or give up, he chose to run not one, not two, but seven marathons in the face of his diagnosis! His vision is to run a marathon on each continent, beginning with a uniquely difficult run in Africa. Through mile-high drops and climbs, possible quick sand, and the Kings of the Jungle, Daniel pushed himself beyond the confines of Father Time. With his loving wife, Connie Rodriguez, by his side, he overcame all odds to prove that he is, and always will be, a fighter. The videos below document his triumph, and set the stage for his upcoming runs (starting with Patagonia this summer). Keep an eye out for Running Against Father Time’s television debut, and enjoy the videos below in the meantime.